Shavonda Williams is taking sobriety seriously, and in turn, has the opportunity to watch both her personal and professional success fall into place. Williams received Individual Placement and Support (IPS) services through Monarch’s Winston-Salem behavioral health site, working with Employment Support Professional Gary Bowen along with Lead Employment Support Professional Brian Holloway. Bowen first met Williams in 2017 when she was referred to IPS services through a Monarch behavioral therapist. Williams is honest about her past substance use struggles and believes her will to overcome addiction combined with her professional successes keep her traveling a healthy path. Her hard-fought battles with substance use disorders, depression and bipolar diagnoses throughout her life, make the successes of sobriety that much more valued. Williams conveyed that her first experience with substance use began as a young girl. “My first drink of wine was at 7 years old. This was the first time I can remember dealing with alcohol. I grew up around liquor and card games. Not an ideal environment for a child,” she explained, noting that she moved on to a variety of other drugs. Raised in Winston-Salem, Williams moved to Georgia as an adult, but about nine years ago returned to live in North Carolina. Through therapy and the job search services of IPS, she has turned her life around and is looking forward to helping others. Williams was a certified nurse assistant (CNA) for 22 years, but she lost her credentials and needed to make some important career decisions. Bowen assisted Williams with the important details of a job search like creating a resume and establishing proper interview skills. He also assisted Williams with navigating the county’s vocational rehabilitation program which assisted with financial assistance for her education. After she passed her CNA certification, Williams had three interviews resulting in three job offers. She now has a full-time CNA position working with patients one-on-one and living in her own apartment. Williams is grateful for Bowen’s guidance in her life. Today, Williams is proud of her professional accomplishments, as well as her strong relationship with her daughters. She always keeps top of mind how hard fought her recovery has been. “My daughters are supportive of my sobriety and what I need to do to succeed . . . They ask me my suggestions on how to deal with life,” she confided. Williams has made plans to enroll at Winston-Salem State University to continue studying and pursue a degree in social work as another avenue to share her experiences and help others who are struggling with addiction. “I don’t want my pain and suffering to be in vain. I want to be a blessing to people . . . I want to be a lighthouse to get people safely to shore,” Williams described. 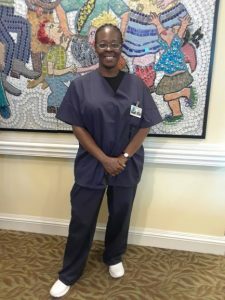 Photo caption: Shavonda Williams, who received IPS services through Monarch’s Winston-Salem behavioral health site, takes a break from her job as a certified nursing assistant.